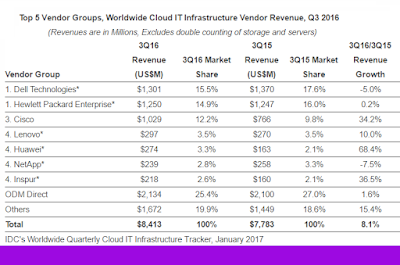 Vendor revenue from sales of infrastructure products (server, storage, and Ethernet switch) for cloud IT, including public and private cloud, grew by 8.1% year over year to $8.4 billion in the third quarter of 2016 (3Q16), according to IDC's Worldwide Quarterly Cloud IT Infrastructure Tracker. "New cloud data centers have begun to launch, but in the third quarter the effect on the cloud IT infrastructure market was minimal," said Kuba Stolarski, research director for Computing Platforms at IDC. "As network upgrades continue to prop up cloud growth overall, the hyperscale cloud datacenters are coming and they will drive new server and storage deployments over the next few quarters. Recently, there has been renewed strength in emerging markets and among smaller cloud service providers. As OpenStack has become easier to implement and maintain by a growing population of capable system administrators, private cloud options are becoming more viable in an increasing set of use cases and with a wider set of deployment parameters." 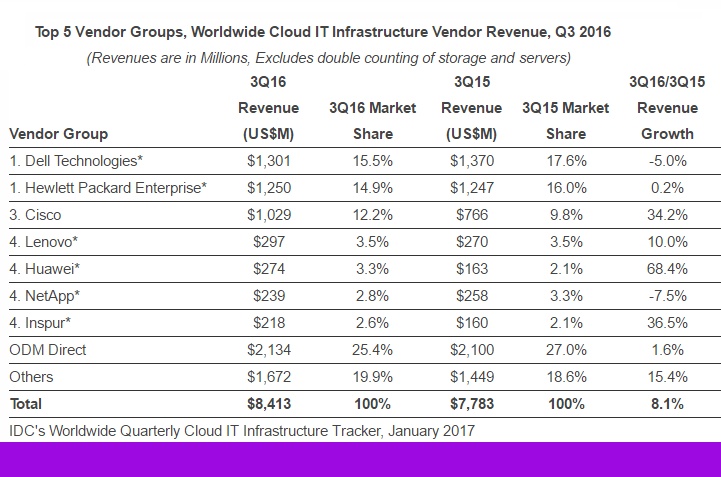 The overall share of cloud IT infrastructure sales climbed to 39.2% of all IT infrastructure spending in 3Q16, up from 34.7% a year ago. Revenue from infrastructure sales to private cloud grew by 8.2% to $3.3 billion, and to public cloud by 8.0% to $5.1 billion. Revenue in the traditional (non-cloud) IT infrastructure segment decreased 10.8% year over year in the third quarter. Private cloud infrastructure growth was led by Ethernet switch at 60.8% year-over-year growth, followed by storage at 9.0%, and server at 3.2%. Public cloud growth was also led by Ethernet switch at 46.2% year-over-year growth, followed by server at 6.8% storage at 3.0% year over year. In traditional IT deployments, server declined the most (12.9% year over year) with Ethernet switch and storage declining 1.6% and 8.6%, respectively. From a regional perspective, vendor revenue from cloud IT infrastructure sales grew fastest in Middle East & Africa at 36.7% year over year in 3Q16, followed by Japan at 29.9%, Latin America at 21.7%, Western Europe at 16.8%, Asia/Pacific (excluding Japan) at 11.9%, Canada at 5.3%, Central & Eastern Europe at 4.3%, and the United States at 2.9%. Greenpeace report: Who Is Winning the Race to Build a Green Internet? Apple, Google, Facebook, and newcomer Switch are leading the charge to build a renewably powered internet, according to a newly released report from Greenpeace, due to their actions in transitioning their data centers to renewable energy sources. Nearly 20 leading Internet companies have now committed to 100% renewable energy. In total, the energy footprint of the IT sector as a whole is currently estimated to consume 7 percent of global electricity. However, Greenpeace finds that the reality is that "much of the sector continues to grow rapidly in Asia and U.S. markets like Virginia, both of which have little to no renewable energy options." Greenpeace cites Amazon Web Services as a prime example of "a company that talks up its renewable projects, but keeps customers in the dark on its energy performance while expanding into markets served by dirty energy like Virginia.” Likewise, Chinese Internet giants, including Tencent, Baidu, and Alibaba, have not committed to 100 percent renewable energy and lack basic transparency around their energy performance. 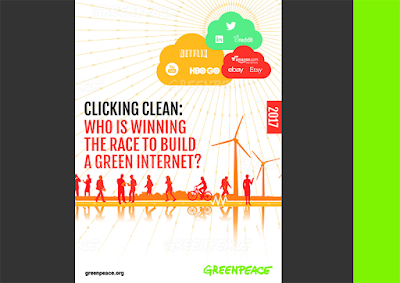 The Greenpeace report scores the renewable efforts of nearly 70 websites and applications popular in the U.S., China, and South Korea. Ericsson and China Mobile signed a strategic agreement to cooperate on the Internet of Things. Ericsson signed a separate Memorandum of Understanding (MoU) with China Mobile Research Institute (CMRI), the research division of China Mobile, to initiate the collaborative research and development of Cloud RAN. On the IoT front, China Mobile will use the Ericsson Device Connectivity Platform to streamline the process for provisioning, as well as deploy services to capitalize on new business opportunities. With the Ericsson platform, China Mobile will be able to integrate resources of roaming partners and offer global enterprise customers reliable connectivity based on service level agreements. Other benefits include a common and unified approach to customer portals and selection of access network. Yuejia Sha, Executive Vice President, China Mobile, says: "China Mobile expects to have 200 million IoT connections by 2017. We stick to the strategy of open cooperation with our partners for win-win results. China Mobile strengthens the collaboration with global leading enterprises of advanced platform, application and intelligent hardware to drive the rapid development of our industry, and provides superior applications and services to our customers." Chris Houghton, Head of Region North East Asia, Ericsson, says: "We are very proud to be selected by China Mobile as a strategic partner for Internet of Things. These types of applications will also help promote the development and deployment of 5G technology. We look forward to supporting China Mobile and developing this business while accelerating large-scale deployments of Internet of Things across the world." Major Korean service provider LG U+ (a member of the LG Group) has selected Juniper Networks technology for its next-generation 5G network upgrade, which includes the Juniper Networks virtual route reflector capability within the vMX, and the EX4300/EX2200 Ethernet Switches. Auto Recovery - the ability to automatically recognize network errors and then dynamically create a new Virtual Router immediately in order to ensure seamless service continuity. Auto Healing - the ability to prevent system overload if operator-defined maximum CPU and memory utilization values are exceeded. Juniper's solution also has the openness and flexibility to support third-party hosted operating systems, hypervisors and orchestration tools, while also providing modular customization.Similarly, the EX4300/EX2200 Ethernet Switches feature Virtual Chassis technology that simplifies management while reducing operational costs. Juniper Networks has also enabled IPv6 routing, anti-hacking and anti-DDoS attack services in LG U+'s NFV infrastructure, with additional features that could be added in the future. "We are very excited about Korea's first commercial launch of a carrier-grade NFV-based router. I believe this will enable us to not only drastically improve our routing performance, but provide greater stability and a more diverse range of services for our customers. As a leader of the 5G era, LG U+ plans to expand the adoption of NFV equipment in close, continued cooperation alongside Juniper Networks," stated Jae-ho Choi, General Manager, Transport Platform Development Team, LG U+. 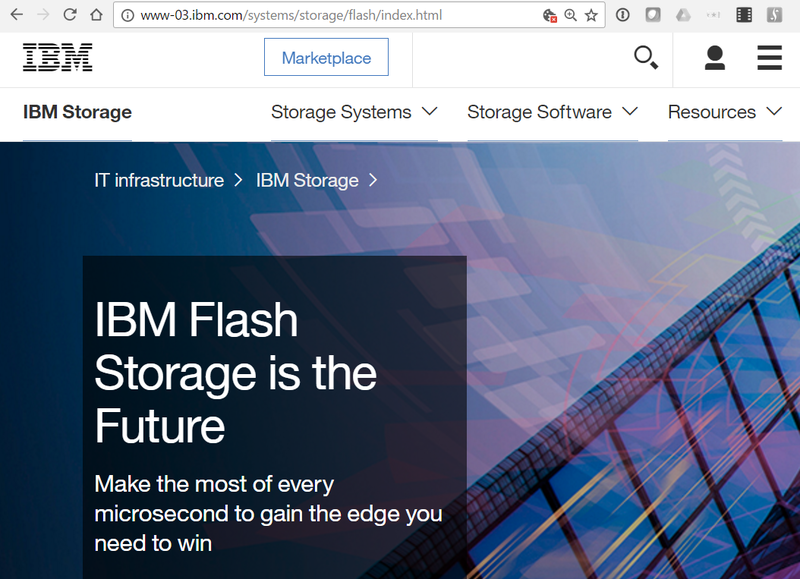 IBM introduced new, all-flash storage solutions designed for midrange and large enterprises with application workloads varying from enterprise resource planning (ERP) and financial transactions to cognitive applications like machine learning and natural language processing. 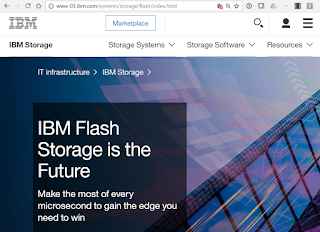 IBM said its flash solutions now deliver “six nines availability”, ensuring continuous operations 99.9999 percent of the time. The company is also providing deep integration between IBM Storage and IBM z Systems using co-developed software that provides data protection, remote replication and optimization for midrange and large enterprises. Business Class Storage – the IBM DS8884F has been designed for traditional applications such as ERP, order processing, database transactions, customer relationship management and human resources information systems. It offers the lowest entry cost for midrange enterprises with 256 GB Cache (DRAM) and between 6.4-154 TB of Flash Capacity. Enterprise Class Storage - the IBM DS8886F has been engineered for high speed transactional operations like high-performance online transaction processing, high-speed commercial data processing, high-performance data warehouse and data mining and critical financial transaction systems. It provides users 2 TB Cache (DRAM) and between 6.4-614.4 TB of Flash Capacity. Analytic Class Storage – the IBM DS8888F is ideal for cognitive and real-time analytics and decision making including predictive analytics, real time optimization, machine learning and cognitive systems, natural language speech and video processing. To support this it delivers 2 TB Cache (DRAM) and between 6.4 TB-1.22 PB of Flash Capacity providing superior performance and capacity able to address the most demanding business workload requirements. BT announced immediate availability of Trend Micro’s Deep Security data centre solution on BT’s Cloud Compute platform, enabling protection for physical, virtual, and cloud servers from a single integrated platform, on a pay-as-you-go basis. Deep Security’s capabilities include anti-malware, host-based firewall, intrusion detection and prevention, integrity monitoring, log inspection, and globally trusted SSL certificates to protect customers from ransomware, advanced persistent threats, targeted attacks, etc. Deep Security is available across BT’s 22 global cloud delivery zones in 19 countries across Europe, the Americas, Middle East and Africa and Asia Pacific. 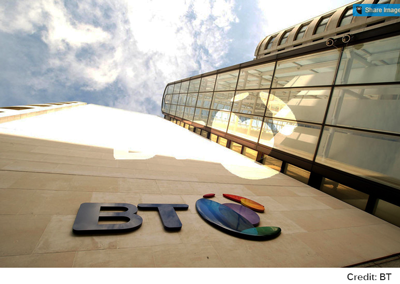 Customers will receive the option to turn it on when they order Cloud Compute through BT’s award-winning Compute Management System (CMS). They can activate as many or as few modules as needed on all or specific parts of their cloud infrastructure. 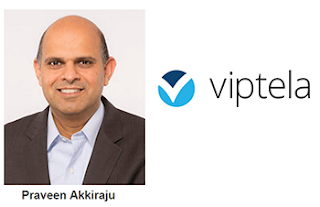 Viptela, a start-up offering SD-WAN solutions, named Praveen Akkiraju as its new CEO, replacing Amir Khan, co-founder and current CEO, who will continue playing an active role as President and board member. Mr. Akkiraju has served as CEO of VCE for the past four years, where he led the converged infrastructure provider to the No.1 market share position, while tripling revenues to $2.1B and achieving profitability. Prior to VCE, he spent more than 19 years at Cisco, including his last role as senior vice president & general manager of Cisco’s Enterprise Networking group. Viptela is backed by Redline Capital, Northgate Capital and Sequoia Capital.